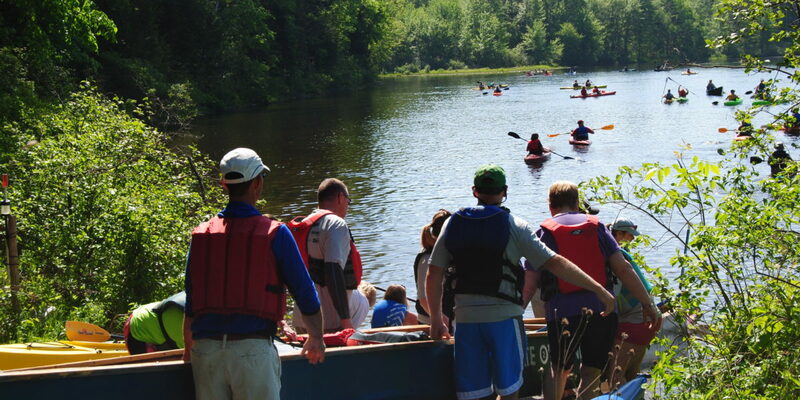 The sun was shining, the sky was blue and the waters were calm as 202 paddlers set out from Evergreens Campground in Solon for a seven-mile kayak trip down the Kennebec to North Anson. They were paddling for a purpose. Their goal was to raise $60,000 for the 20th Annual Bath Savings Institution Paddle for Pine Tree Camp. All proceeds from the Bath Savings Institution Paddle for Pine Tree Camp directly support the Campership Fund, and are a critical part of the Camp’s open door tuition policy. Since 1945, Pine Tree Camp has welcomed all who could benefit, regardless of their ability to pay. Team captains like Louann recruited energetic, committed paddlers who traveled from as far away as Connecticut. Steve Soucy’s “Team Maine and Connecticut Water” had 21 members and 17 paddlers. For Steve, it was a great feeling to have everyone together enjoying the outdoors with co-workers and their families. The smooth operations of the paddle were supported by a team of volunteers who ensured that all aspects of the event ran efficiently – from registration and logistics to water safety to the post-paddle celebratory barbecue. They joined volunteers from the Maine Warden Service to be sure paddlers were safe and following the route. Aaron has been a Camper since 1979 so this paddle has special meaning for her family.